It has happened to the best of us, myself included. You spend hours typing, editing, formatting your blog post. You review it multiple times, insert images, create amazing graphics, and excitedly press “publish”. You can’t wait to share your new post with your followers all across social media. You rush into groups to post your new link and ask others to share, comment, and/or like your post. You watch your new post gain traffic and are excited to see how others respond to it. You visit your site, perhaps to respond to comments or just to see how the post looks, and that’s when you see it… a grammatical error, a spelling error. How did you not catch it? You read the post over and over, yet still you missed it. I don’t know about you, but this happens to me often. Not just with blog posts, but with documents, manuscripts, books I’ve written. No matter how many times I proofread it or have another set of eyes review it, more than likely I wind up with a some sort of error. Grammarly is a must have app for all bloggers, writers, and authors. This tool is a great writing hack that can even be used by students when writing research or term papers for school. But that’s not all, are you tired of not being able to edit your tweets? I mean Twitter has increased characters, added all these other features, and all we want is the ability to edit… come on Twitter! Well this app even works to help make your social media experience mistake free. This app is good for business professionals and workers building resumes and writing cover letters. Whatever your writing need, Grammarly has got you covered. Grammarly will detect grammar, spelling, punctuation, word choice, and style mistakes in your writing automatically and suggest improvements. I use Grammarly for all of my posts and writings. Nothing is 100%. Nobody is perfect. But I can say that by using this app, has drastically reduced the amount of errors in my work. I use the free version of Grammarly which offers many great features such as with grammar and spelling error detection. However, Grammarly Premium takes things a step further with features such as advanced error checks, vocabulary enhancement suggestions, and the premium version even checks your work against billions of webpages for plagiarism. So if you want to keep your work 99.9999% error free, I suggest you get this app. 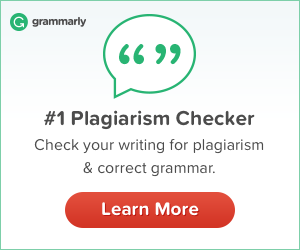 Sign Up for Grammarly today. You won’t be disappointed. Check out my Blogging Resources page for other great tools for your blog. Be sure you get Grammarly now. I could use this! Thanks! No matter how much I check my stuff, sometimes an error gets thru and this will avoid that. It is a great tool to have!